As a friend on Instagram opined, the best thing about January is the release of Bell’s Hopslam. I wholeheartedly agree. January is a cold and miserable winter month, and Hopslam brings me happiness. For the uninitiated, Hopslam Ale is a double IPA brewed by Bell’s out of Michigan. Hopslam was one of the first, if not THE first, big IPA. 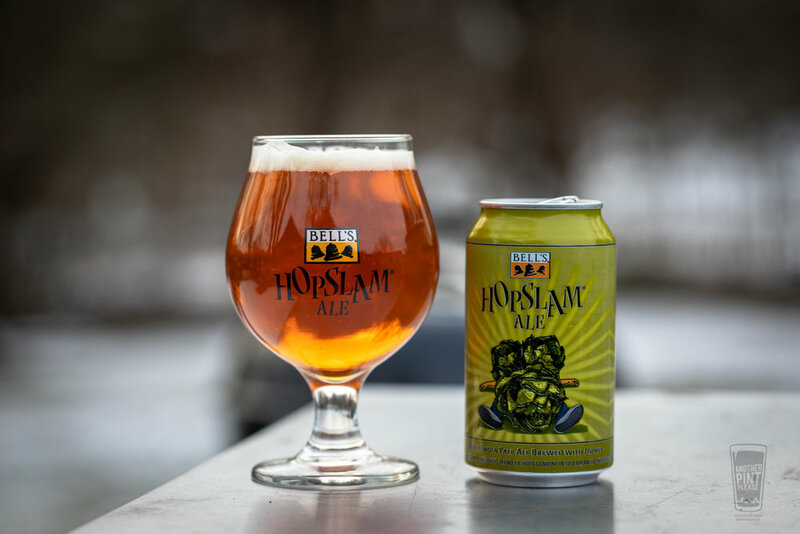 There are a ton of Hopslam mentions on the pages of this blog going back twelve years to the first time Eric and I tried it. 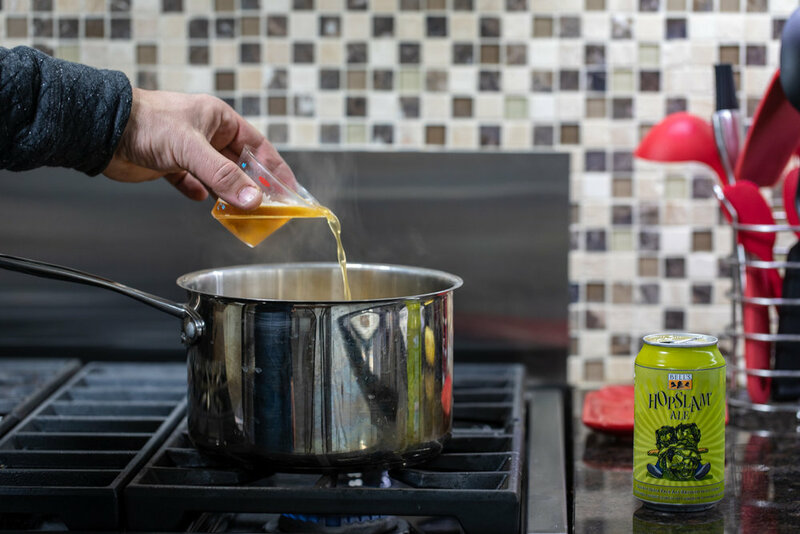 While Hopslam is packed full of citrusy hop notes, it is balanced by its sweet malt bill and a healthy addition of honey. This bitter/sweet tango makes Hopslam very easy to drink, especially for non-IPA drinkers. The only catch? It has an ABV of 10%. I still remember having three pints of Hopslam with Eric back in the late winter of 2007. It was so incredibly good. It was only later when the double-digit alcohol content slammed into us did we research what we were so happily consuming. Oh, yeah, 10% ABV. No wonder! Every year we await the Hopslam release and scramble to find a 6-pack or 3. It never lasts long on the shelf or in the beer fridge and it really shouldn’t. Hopslam, like all heavily hopped IPAs, lose their hop strength over time. It’s critical to drink fresh. When we first discovered Hopslam, there was a grand total of zero breweries in Dayton. Now there are more than 10. Today, a Double IPA is pretty standard. Every brewery has one or more. Even though the market has changed and choice is everywhere, I still fondly look forward to Hopslam. For starters, I love the beer. However, I also love the memories. As Keith noted on our late-morning Sunday drive to a Hopslam tapping after heavy snow the night before, it’s an adventure. I’m always down for an adventure…and Hopslam. At this aforementioned tapping, the Bell’s rep was handing out recipe cards featuring Hopslam. I snagged one and as you would expect, adapted it for the grill. Place the pecans in a foil pan and grill over indirect-medium low heat (250° to 350° F) for approximately 5 minutes. Remove from the grill. Once cooled, chop the pecans. While fresh peaches would be great, they are currently out of season, so I opted for frozen. Seeing Bell’s is in Michigan, I opted for Michigan peaches. Purely a coincidence! For frozen, figure 1 cup per peach. In a large pot, add the peaches, water, sugar, and lemon. Cook over medium-low heat for 10 to 15 minutes. If the peaches are frozen, add on another 10 minutes. Add Hopslam, red pepper flakes, and chopped pecans. Cook an additional 5 to 10 minutes or until the liquid has reduced and the mixture begins to set. Either smash the peaches with a wooden spoon or use an immersion blender to break them down to an even consistency. Set aside. Serve the chutney warm or cold. This recipe can be made with single bone pork chops, but I love to use thick double bone pork chops instead. Because of their size, I always use a reverse sear. Perfectly cooked pork is key, and the reverse sear never lets me down. In a small bowl, combine the brown sugar, salt, cayenne, garlic powder, black pepper, and paprika. Lightly brush the pork chops with olive oil and then generously cover with the rub. 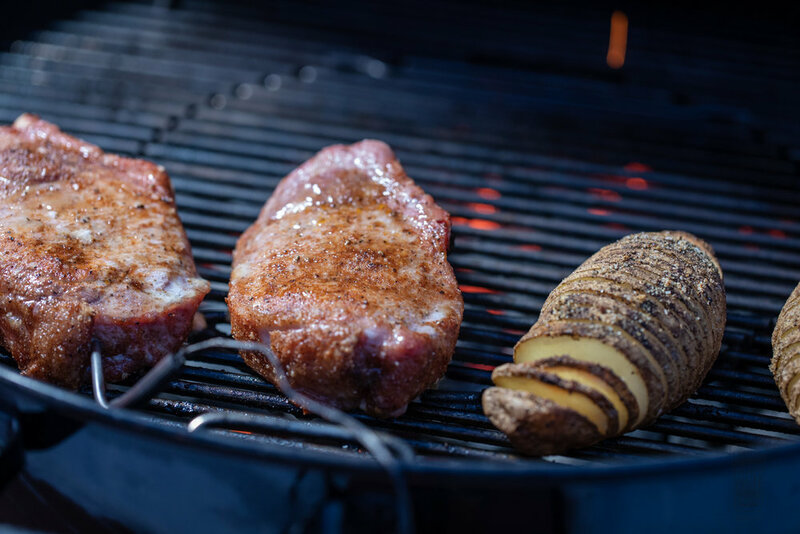 Grill the pork chops over indirect-medium low heat (250° to 350°) until the internal temperature of the pork reaches 135° F with an instant-read thermometer, approximately 20 minutes. The temperature here is key. Just use the time to stay in the range. Remove the pork chops from the grill, tent with aluminum foil and allow to rest for 10 minutes. 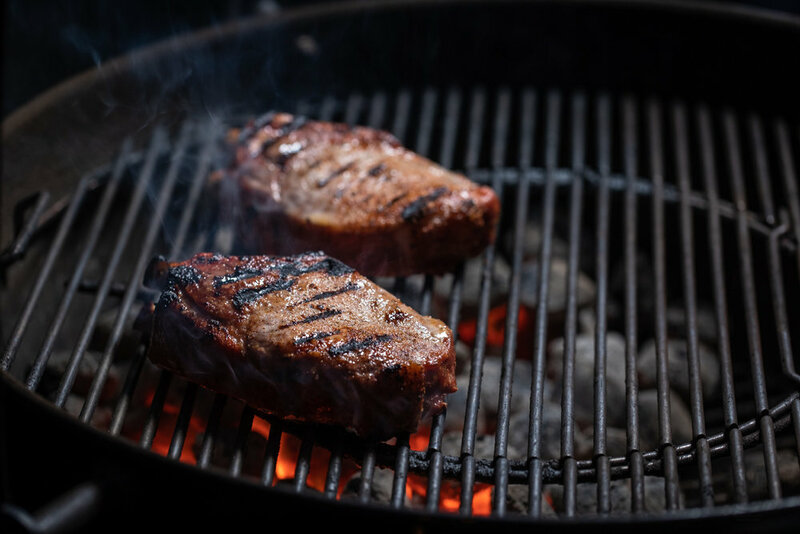 Raise the heat of the grill to high. 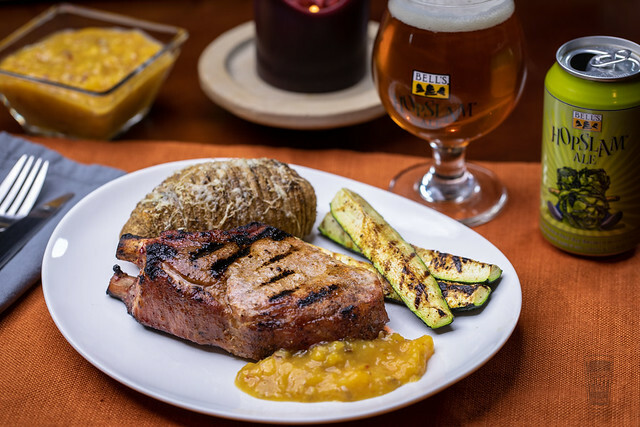 Grill the pork chops over direct-high heat (450° to 550°F) for two minutes, flipping once. Remove, allow to rest, and serve with the chutney. I only like pork chops when I grill them myself, and these do not disappoint. They pack quite a bit of heat, which marries nicely to the sweet tang of the chutney. Just like Hopslam, everything is in balance. For a side, you may have noticed the Hasselback potatoes. 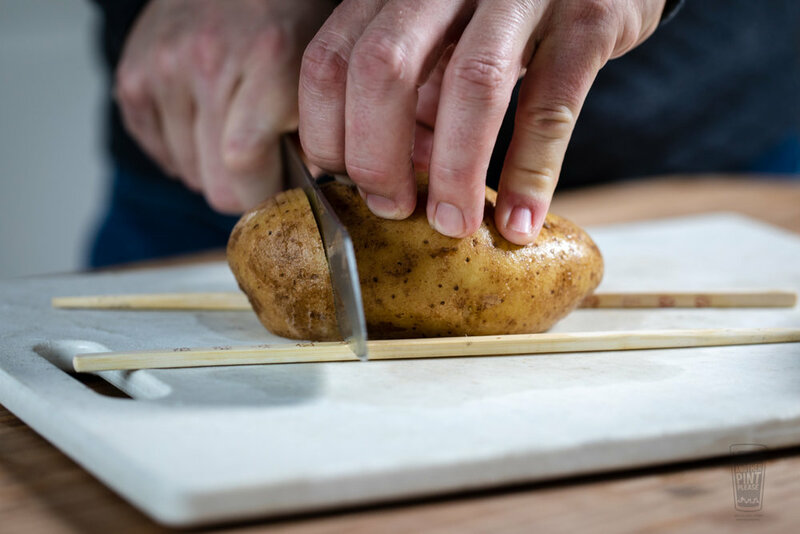 If you are looking to change up your basic grilled potato, use a knife to cut even slices in a potato. Use chopsticks to avoid slicing all of the way through. 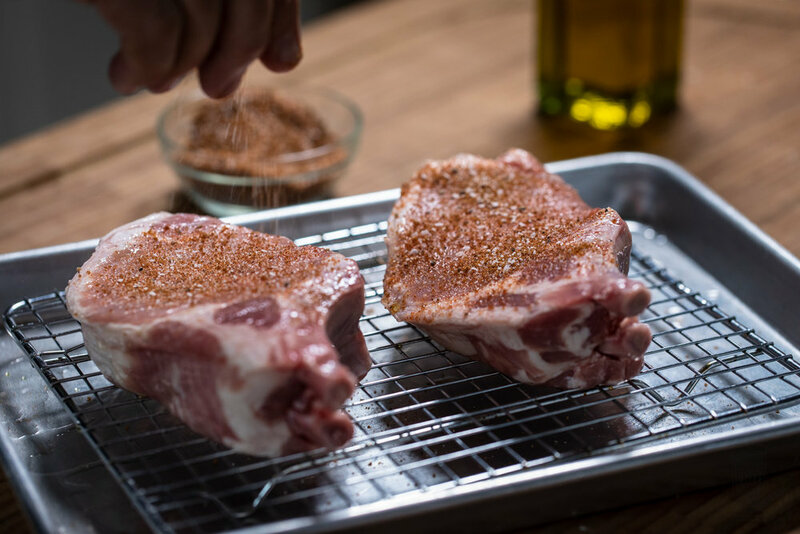 Rub with olive oil and season with any of the remaining pork chop rub. Grill over indirect-medium heat for about an hour and top with grated gruyere cheese the last 10 minutes. NOTE: This is not a sponsored post. I purchased all of my Hopslam...and the some. I did this for fun!